OK – so we may have got slightly carried away with our opening paragraph, but after discovering a vast realm of unexplored jungle and towering cloud forest in Northern Peru, where the secrets of a fearsome civilisation that once ruled these lands were unlocked, we knew that our imaginations would never be the same again. 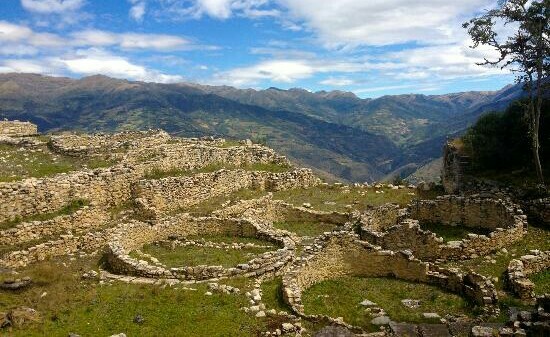 The lesser visited Northern highlands of Peru hold a treasure trove of historical ruins and natural wonders just waiting to be visited. Travel is slow on the winding and sometimes potholed roads, but for the patient traveller, the rewards are high and plentiful – Pre-Colombian ruins matched in size and splendor only by Machu Picchu, ceremonial burial chambers on high cliffs marked by life-sized sarcophagi and one of the world’s highest waterfalls to name but a few. We based ourselves in the small and friendly market town of Chachapoyas, the departmental capital of the Amazonas region, and explored our surroundings on day trips. Independent travel using frequent local buses is reasonably straight forward but there is also a cluster of travel agencies based around the main plaza who have all types of trips around the area departing most days. We used a mixture of both. The organised tour to this historical site was just marginally more expensive than the two buses we would have had to take and it included an English-speaking guide to bring the history alive, so for us, it was an easy choice. The drive to Kuelap took around two hours from Chachapoyas, along a dusty road which wound upwards into the clouds. There is currently a huge controversy in the area regarding the government’s proposals to install a cable car from the base of the mountain directly to the site to avoid the long access drive and bring more tourism to the area, but many believe this would completely spoil the site as much of its beauty stems from its remoteness and tranquility. The cable car would also mean the site losing its UNESCO World Heritage status because its unique situation on top of a table mountain would be blighted forever. In our opinion, the road wasn’t too bad and perhaps the government would do better improving the road quality and nearby facilities initially. There was no doubt that the site was picked for its strategic viewpoint of three valleys but the king must have also had an excellent eye for beauty as the setting couldn’t have been more pleasing. As we looked up at the 19 metre high walls which stretched for almost 600 metres in diameter and at the countryside laid out below us, we imagined that the kingdom was once an incredible place to live. We followed a path around the outside of the walls and arrived at an entrance. The walls were in remarkably good condition and stretched unbroken around the site and out of three original doorways only two were functioning. We were surprised to find that the entrance was a simple, wide opening with no door and we wondered how this fortress would have defended itself from its enemies. Our guide explained that the entrance became narrower the further inside you went and rather than the modern stairs we could see today, there would have been rows of two metre high steps with ladders which could be retracted if needed. 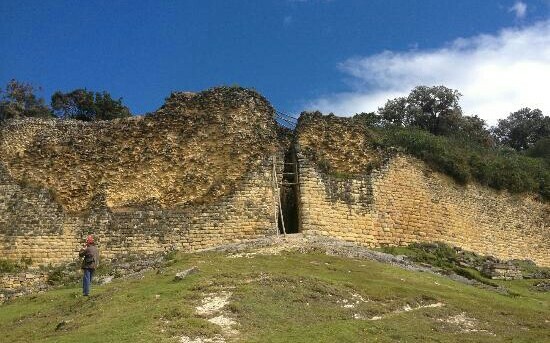 If an attacking army were to force themselves through this entrance point, they would be funneled into an increasingly narrow corridor with high walls and Kuelap’s soldiers would attack from above with spears and boiling oils. 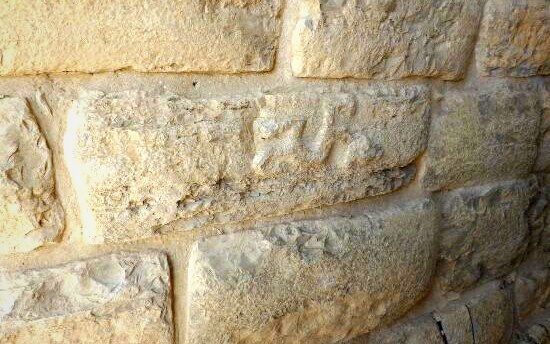 Several ornate faces and animal figures had been carved into the walls of the first entrance which historians believe were created to honour kings, holy men, warriors and visiting dignitaries who would use this entrance. The second functioning entrance was a further 15 minute walk along the wall and was used by servants, tradesmen, peasants and… you’ve guessed it… this was also the entrance us tourists were to take – charming! The original stone slope had been worn smooth with hundreds of years of feet padding up and down. It was also possible to see marks on the rock where cattle had placed their hooves time and again for a steady hold, and marks where they’d skidded. The site was hugely impressive – spread over three levels and an area which at its peak housed 400 people. It had only been reconstructed in one area and the rest had been reclaimed by nature. Tall, green trees sprang up in the middle of circular houses and vines snaked their way around and through stone walls like pipe cleaners pushing through plasticine. It was as if we were discovering a lost world. 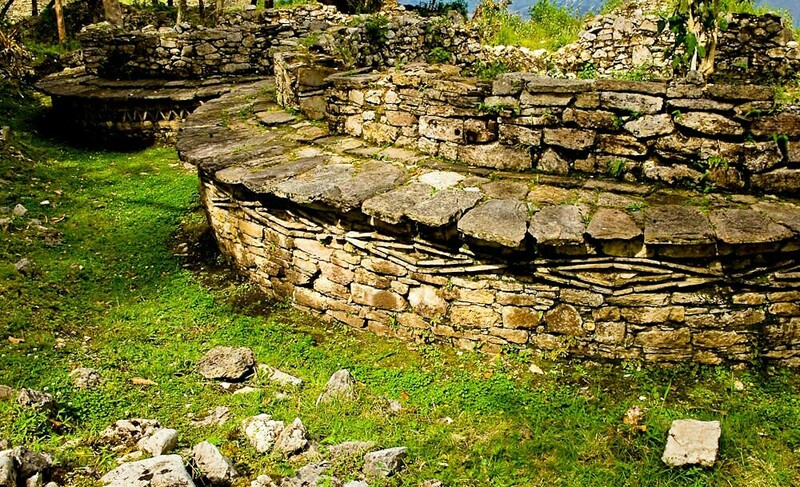 The original pre-Colombian dwellings were circular in shape, containing a dug out for a fire pit and a long rectangular stone box where small livestock such as guinea pigs and chickens would have been kept. Several generations of families lived in the circular houses which would have consisted of one large space used for sleeping, eating and living. It would have been very cosy. It seemed that the more important or wealthy the family, the larger the house and more prominent the position within the settlement. When the site was first excavated, archeologists found bones buried under all of the dwellings, which they believe belonged to individual family members from the household. Along with the king and his family, shamen were considered to be the most important people in the whole community and they lived in particularly large dwellings with significant markings on the outside walls. These markings have helped historians conclude that there were three Shamen living in Kuelap at one time – the jaguar, the snake and the condor – all looking after different areas of healing and rituals. At its summit, Kuelap is 3,100 metres above sea level and the 360 degree panoramic views were incredible. Along a section of the site which spreads out on a narrow outcrop of rock we could see ceremonial spaces poking through dense foliage, and watch towers where soldiers would have spent many hours scanning the countryside for threats. 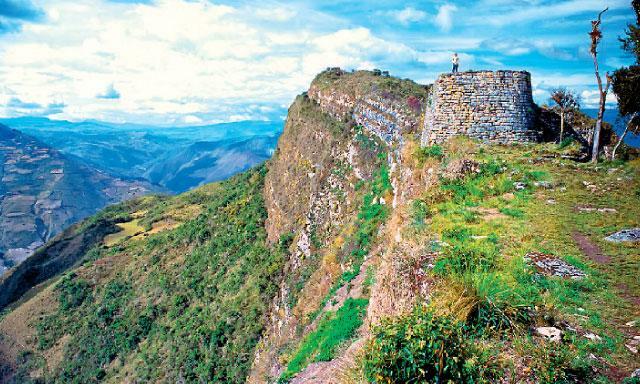 Our guide explained that the Chachapoyan ruled uninterrupted from around 900 AD but in the 1400´s just such a threat came from the mighty Inca empire. 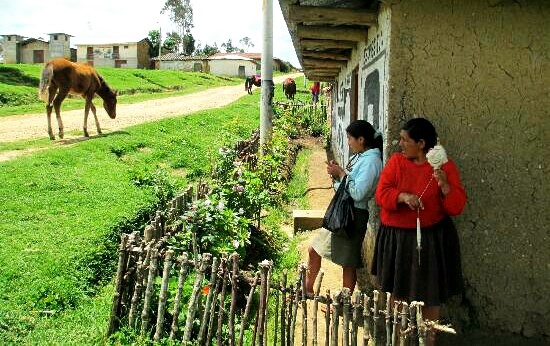 The Chachapoyans held out for several weeks but in the end a simple trick worked. 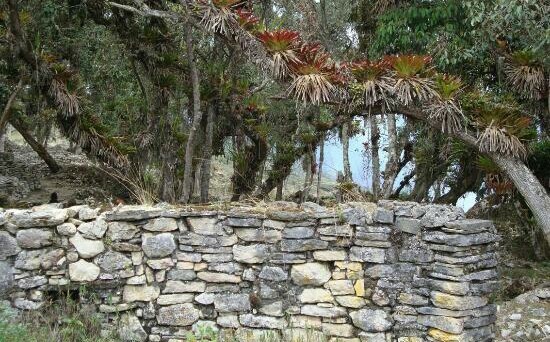 The water supply (deep wells) feeding Kuelap was poisoned and the Incas simply had to wait for a few days for the Chachapoyans to become weak and fall ill before invading. 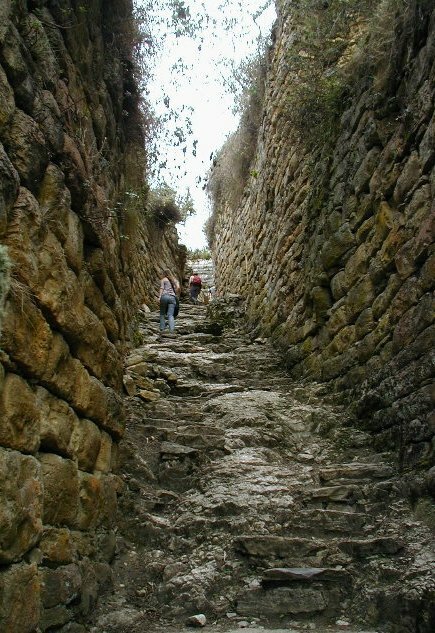 Evidence of the Inca control can be seen in the artifacts found by archeologists at the site, but also by the alterations they made to the dwellings, preferring larger square houses to circular. 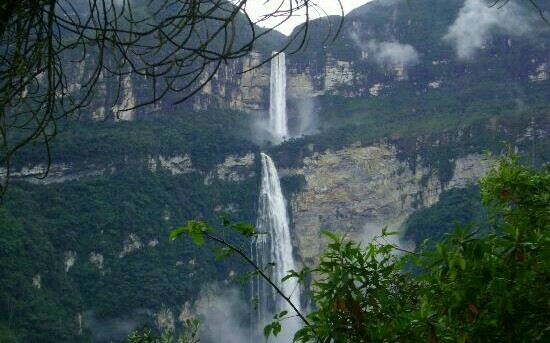 Ironically, in the late sixteenth century when the Spanish Conquistadors arrived in these parts, the Chachapoyans fought alongside them against their old enemies the Incas, and defeated them using their own trick – poisoned water. For us, Kuelap was every bit as special as Machu Picchu but incredibly it only receives a tiny fraction of the visitors compared to its better known cousin. The ruins weren’t as groomed or well restored as Machu Picchu but that was part of its beauty. We got a small sense of what it must be like to discover a site like this for the first time. Intrepid explorers battling through dense jungle to find a hidden city with all of its secrets still intact and ready to be spilled. By taking just a few steps away from our small group, it felt like we were at the site alone surrounded by silence which was only broken by birds singing and butterflies dancing. In our minds, time ran backwards and we saw the tall trees becoming saplings, the weeds receding and the walls rebuilt…until we were back in the bustling community of Kuelap where locals went about their daily business. We were dropped at a house belonging to one of the villagers which also acted as the local convenience store and the ticket office for the site. 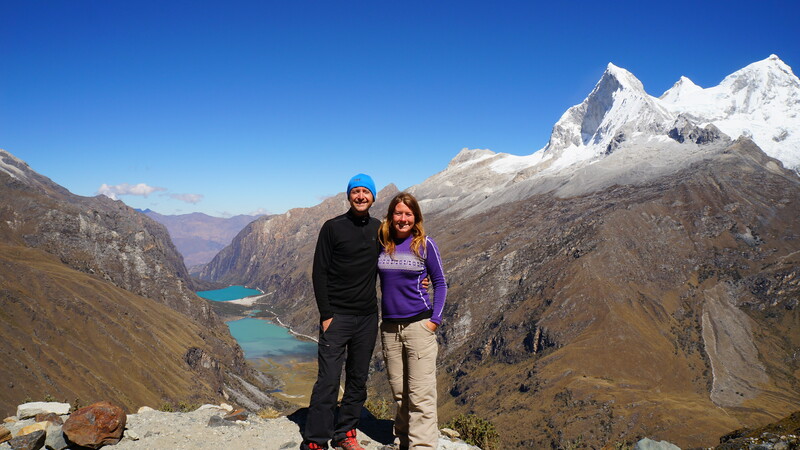 We paid a small fee, signed our names in a rather unofficial looking registration book and repeatedly turned down offers for a guide service before getting on our way. We didn’t need to ask directions as a number of friendly locals pointed us the way unasked – across a small village green and down a sometimes steep and rutted country path. We weren’t sure what to expect from the site but the countryside itself was pretty special. Farmers attached ploughs to bulls and tended to their fields and smiling old women passed us winding huge balls of wool on reels (which we later discovered is used for local handicrafts) and greeted us with smiles, and sometimes to our amusement, the words “Gringos” in surprised but affectionate tones. There was a small gate and sign post at the bottom of the path which led to the site but no one to collect tickets, no guides and no other people so it really felt like we were discovering something that tourists didn’t yet know about. 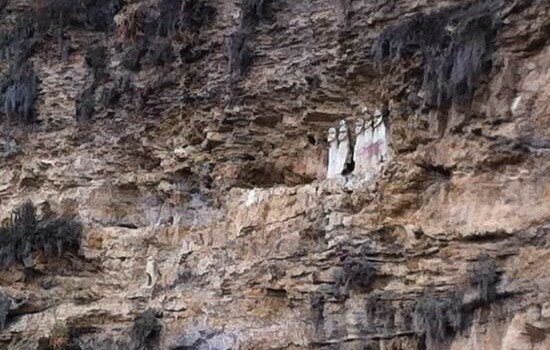 We were struck straight away by six painted statues perched on a high ledge tucked into the cliffs. 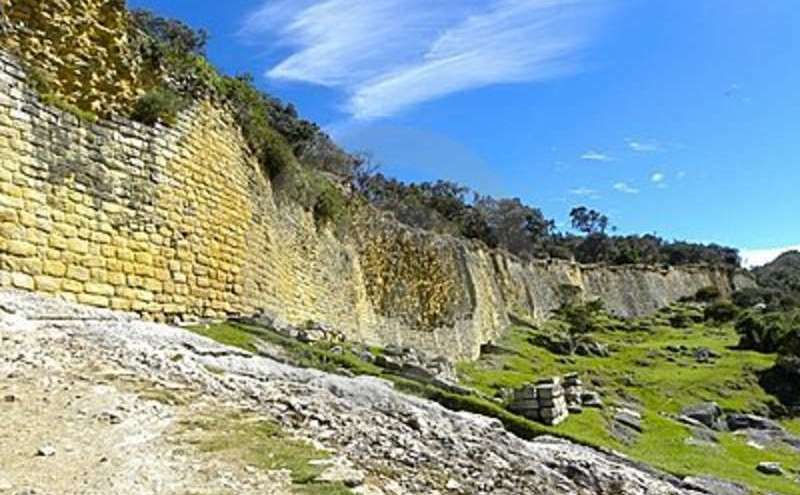 The Chachapoyans used to bury their dead in these high cliffs along with artifacts and possessions they may require in the afterlife, and to ward off grave robbers and evil spirits they placed guardians at the entrance to the caves. The faces of the wooden statues were powerful and fierce and they had a unique presence about them – almost as if their eyes would blink or their heads would turn as we looked away. The path curved around in a semi-circle and passed under an unsafe looking rock overhang. On the other side the land fell away into a deep valley and we could hear running water far below. Along the path were remnants of human bones which had fallen from caves above when rocks had become loose and crumbled away. 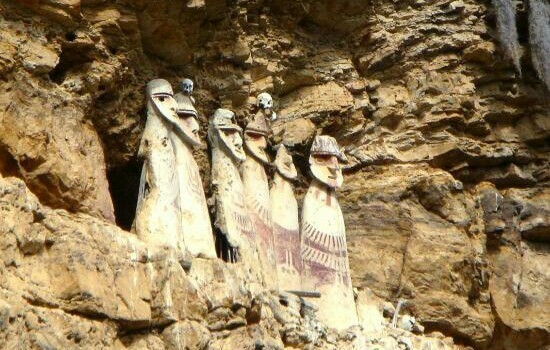 A number of smaller statues could also be seen around the site but these were less well-preserved and even though they added to the atmosphere, they looked more like chunks of rotten wood. 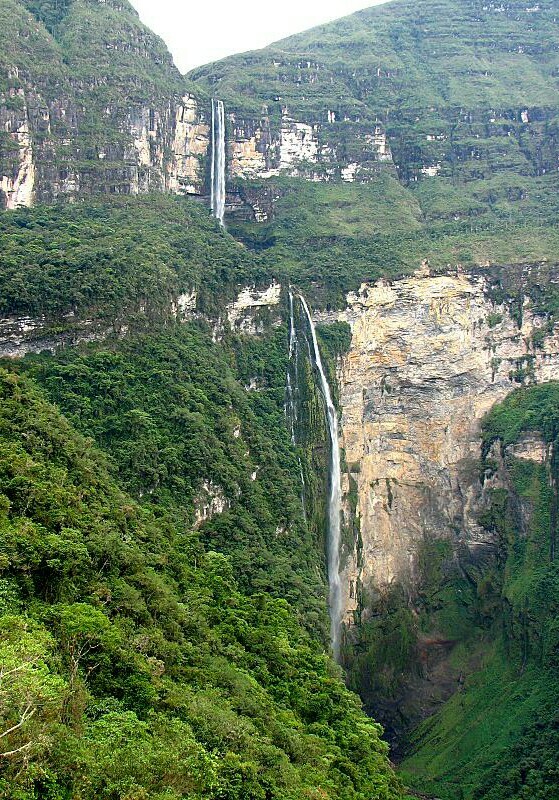 Gocta is recorded as one of the top 20 highest waterfalls in the world. It stands at 771 metres which is the equivalent of a 150 storey skyscraper and it falls in two beautiful drops. 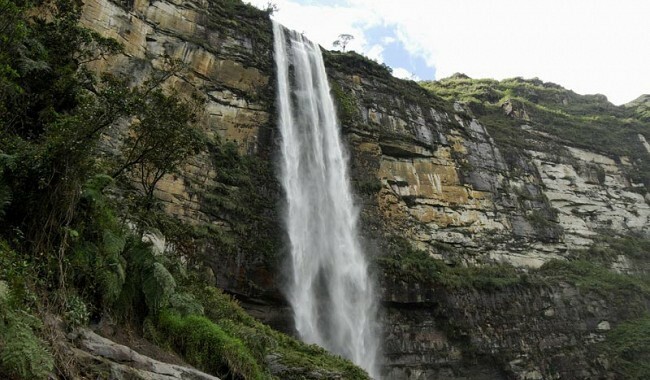 Incredibly, this waterfall was only revealed to the rest of the world in 2005 when German Stephan Ziemendorff stumbled across it with a group of Peruvian explorers and couldn’t find it marked on any regional maps. Of course locals had been aware of the falls for hundreds of years but a legend about a blonde haired mermaid living in the falls who would curse anyone who told of its whereabouts, made certain it was kept a close secret. 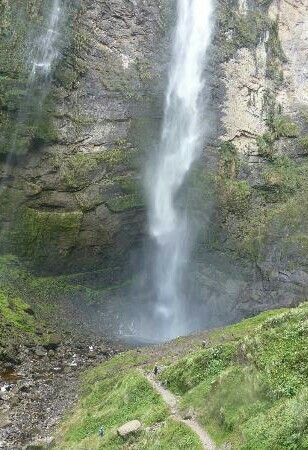 We took a local bus and asked the driver to drop us off at the road leading to the falls. We’d planned to hike the road leading to the park entrance but luckily a shared taxi picked us up only 10 minutes into the walk – and we were relieved as it would have been a very long, hot and uphill hike without many views. We registered at the park entrance and paid the small entrance fee. Arriving at just gone 11.00am the park ranger gave us strict instructions that we were only to walk to the lower level cascade and not to attempt to climb to the higher viewing point. We nodded dutifully but of course this was exactly what we were planning to do. 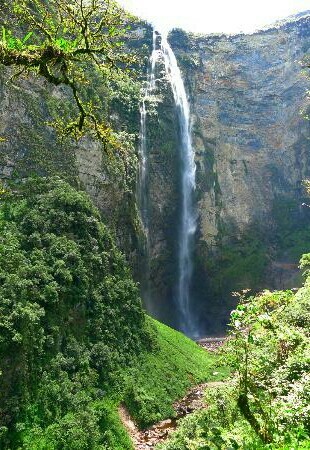 The walk to the base of the lower cascade took around one hour and fifteen minutes at a good pace. The trail initially skirted around the edge of a wide valley where we saw our first glimpse of the impossibly tall falls and then through a lush woodland area with bubbling steams to cross. A steady stream of water plummeted from the edge of a high, flat plateau which was nearly in the clouds. It tumbled into a deep plunge pool where it was swept with some force towards the second precipice and into a fast free-fall to the base. By the time the water reached the bottom it had transformed into an umbrella of fine mist. High cliffs formed a semi-circle of rock either side of the falls and made the thunderous crash of the water even louder. Over many years a mosaic of moss and small plants had sprung up all over the walls and dripped with water spray. We stood in awe craning our necks upwards and we really didn’t care that we were swiftly becoming soaked. Briefly doubling back on the trail, another path led us across the river and we embarked on a tough and seemingly never-ending climb to the higher viewing point. A small terrier dog we’d befriended at the lower falls, and which seemed to belong to no-one, followed us dutifully part of the way looking for scratches behind the neck and any food we could offer until trekkers walking in the other direction took his fancy and our loyal companion abandoned us. After about two hours of climbing uphill we arrived at the high falls, our clothes soaked in sweat and our legs like jelly. A series of slippery, rickety ladders and wooden planks took us to a platform right in front of the falls. We hid from the spray behind a large rock and darted out a few seconds at a time to admire the view. We appreciated the force of nature as gusts of wind caused by the power of the falls pushed us backwards, the icy cold water splashed in our faces and the drumming of the falls rang in our ears. From deep pools, where light did not seem to penetrate, a stream danced over rocks for 20 metres and then plummeted again. We crept closer to the edge trying to catch a glimpse of the vertical drop below. Clambering over slippery rocks our hearts pounded realising that one wrong move could spell disaster. We stopped around three metres back from the edge and admired the infinity pool of water and the views. A world where we assume that all historical and natural wonders have already been discovered can be slightly demoralising. Where the only way to get to know an attraction is by purchasing a pricy entrance ticket alongside hundreds of camera touting tourists, we tend to dread the experience rather than feel excitement. 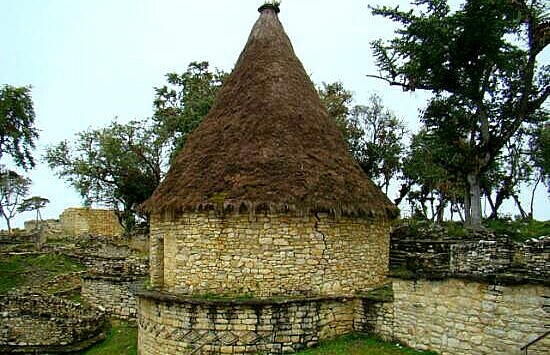 The countryside and historical sites around Chachapoyas restored our faith that lost jungle cities or off the radar natural attractions still exist. We felt like we’d been let into a huge secret and we were allowed to become intrepid explorers. We felt reluctant to share our stories about this special area with anyone in case the magic was lost, but these places are too special not to shout about and its treasures too great for two people alone.